If your looking for some good chocolate desert to add to your next meal try one of the Original Hershey Chocolate Recipes. I copied the original Fudgey Brownies and Deep Dark Chocolate Cake from the back of a Hershey Coco can. In the mid 1990's they changed the recipe to be more healthy. However, nothing can compares to the original. While I strongly suggest eating healthy, there's nothing wrong with enjoying a special treat every once in a while. 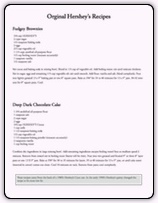 Download the Orginal Hershey Chocolate Recipe PDF and treat yourself tonight!